UK Bike Fest is a fantastic new concept brought to you by Monopoly Events which brings you Europe's biggest indoor motorcycle festival. With great guest star names, live music, amazing acts, trader stalls, Q&A panels, competitions, food and drink and even indoor camping there is nothing we haven't thought of! 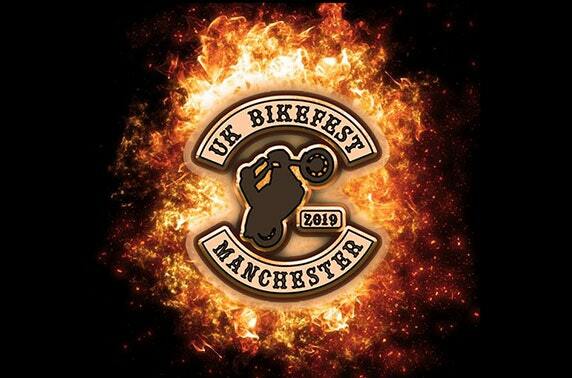 Join us on 24th-27th May 2019 in Bowlers Exhibition Centre, Manchester for UK Bike Fest 2019! ClubAZ Member now receive 25% off tickets. CLICK here to book and use code UKBF to claim your discount. Each week we have new offers to help you save money. There are big prize competitions and you automatically have the chance to join the ClubAZ Lottery to win big cash prizes each month. This website is not produced by AstraZeneca. ClubAZ is an independent organisation owned by its Members. The content used in this website may not coincide with the employees’ and contractors’ responsibilities under the AstraZeneca global code of conduct and individual terms of employment.